CHICAGO, IL--(Marketwired - Nov 5, 2013) - Gold Eagle Co., makers of America's #1 selling brand of fuel stabilizers and ethanol treatments, STA-BIL®, is today unveiling an innovative new product called STA-BIL® 360° Protection Ethanol Treatment and Fuel Stabilizer ("STA-BIL 360°"). 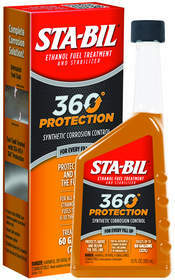 Designed to combat the corrosive properties of today's ethanol-blended fuels, STA-BIL 360° is the first ethanol treatment to deliver comprehensive corrosion protection above and below the fuel line through revolutionary, new chemistry. "We're proud to introduce STA-BIL 360°'s comprehensive corrosion protection formula to the marketplace for the very first time, offering an entirely new way to protect the fuel system," said Marc Blackman, president and CEO of Gold Eagle Co. "STA-BIL 360° builds off STA-BIL's strong brand reputation and category leader position to deliver an innovative, unmatched product that we believe is a game-changer in the fuel additives category." To meet the demands of consumers seeking ultimate performance, STA-BIL scientists developed this innovative product to deliver comprehensive corrosion protection. When added to fuel, STA-BIL 360° releases a vapor inside the fuel system that coats all metal parts including the fuel tank, fuel sending unit, valves, carburetor, fuel injectors and intake manifold. Offering 360 corrosion protection, STA-BIL 360° is safe and recommended for use in all types of gasoline from ethanol-free fuel to E85 blends. "We designed STA-BIL 360° for our most discerning customers seeking the utmost level of protection for their investments from classic automobiles to vintage motorcycles collectors," said Tom Bingham, director of marketing for Gold Eagle Co. "There are thousands of classic vehicle owners today, who are keen on practicing proper fuel management and understand the financial repercussions of corrosion. With the introduction of STA-BIL 360°, we're able to offer customers a dynamic selection of premium and trusted fuel stabilizers and ethanol treatments for their every need." Delivering ultimate year-round protection, STA-BIL 360° is recommended for use at every fill-up in all gasoline engines. Available in 12 ounce bottles, STA-BIL 360° treats up to 60 gallons of gasoline and will retail for approximately $25.99. STA-BIL 360° is currently available to retailers for pre-order by contacting 800-367-3245. Consumers will be able to purchase STA-BIL 360° at select retail stores nationwide in early 2014. STORAGE - STA-BIL Fuel Stabilizer is designed for use during off-season storage in all vehicles and equipment to protect against gum, varnish formation and corrosion in the fuel lines and engine. PROTECTION - STA-BIL Ethanol Fuel Treatment and Stabilizer protects engines against the harmful effects of ethanol in today's gasoline and is intended for use at every fill-up in vehicles and small gasoline powered equipment. MARINE - Marine Formula STA-BIL Ethanol Fuel Treatment and Stabilizer is intended for use at every fill-up in boats, jet skis or other marine equipment and contains double the corrosion preventers and four times the fuel system cleaner to protect sensitive marine engines. DIESEL - Diesel Formula STA-BIL keeps diesel fuel fresh, promotes thermal oxidative stability, protects against corrosion and removes water from the fuel system to protect diesel engines. Learn more about STA-BIL products at www.sta-bil.com or join the STA-BIL community at www.Facebook.com/STABILBrand. For more than 80 years, Gold Eagle® Co. has been an industry pioneer in the production and distribution of aftermarket fluids and additives. We create products that help preserve, protect and enhance the performance of engines everywhere. We are a leader in the product development, manufacturing, marketing, and distribution of branded engine performance and maintenance chemicals. Privately held and headquartered in Chicago, Gold Eagle Co. is the manufacturer of leading brands, including STA-BIL® Fuel Stabilizer, HEET® Gas-Line Antifreeze, NO LEAK® Treatments, 104+® Octane Boost, Start Your Engines!®, DieselPower!® Diesel Additives, 303® Aerospace Protectant and 303® Fabric Guard. To view our complete line of Gold Eagle products or learn more about the Company, please visit http://www.goldeagle.com or "like" our STA-BIL, 303 Products, Start Your Engines! or Engine Answerman pages on Facebook. For product questions, please call us at 800-621-1251 or follow us on Twitter @GoldEagleHelp. About this company Gold Eagle Co.